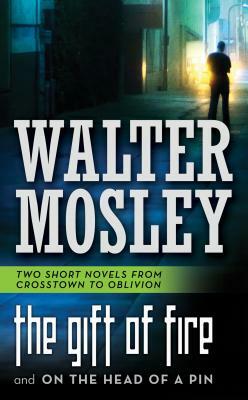 "New York Times" bestselling author Walter Mosley delivers two speculative tales, in one volume, of everyday people exposed to life-altering truths. "The Gift of Fire "
In ancient mythology, the Titan Prometheus was punished by the gods for bringing man the gift of fire an event that set humankind on its course of knowledge. As punishment for making man as powerful as gods, Prometheus was bound to a rock; every day his immortal body was devoured by a giant eagle. But in "The Gift of Fire," those chains cease to be, and the great champion of man walks from that immortal prison into present-day South Central Los Angeles. "On the Head of a Pin "
Joshua Winterland and Ana Fried are working at Jennings-Tremont Enterprises when they make the most important discovery in the history of this world or possibly the next. JTE is developing advanced animatronics editing techniques to create high-end movies indistinguishable from live-action. Long dead stars can now share the screen with today's A-list. But one night Joshua and Ana discover something lingering in the rendered footage an entity that will lead them into a new age beyond the reality they have come to know. WALTER MOSLEY is one of the most versatile and admired writers in America today. He is the author of more than thirty-four critically acclaimed books, including the major bestselling mystery series featuring Easy Rawlins. His short fiction has been widely published, and his nonfiction has appeared in "The New York Times Magazine "and "The Nation." He is the winner of numerous awards including an O. Henry Award, a Grammy, and PEN America's Lifetime Achievement Award. He lives in New York City.